When the Tri-City Americans filed their injury report with the WHL office on Monday, it included both their goaltenders, two defencemen and three forwards. Under ‘additions,’ the Americans listed the names of four affiliate players who have been brought in as the teams attempts to get through this adversity. F Parker Bowles, who leads the Americans in assists (31) and points (44), and D Carter Cochrane are out indefinitely. Both have shoulder issues and might be done for the season. F Braden Purtill is out for up to six weeks. Richard Nejezchleb, who may be the most gifted offensive player on the roster, and D Dylan Coghlan both were listed as day-to-day, but they played last night against the visiting Portland Winterhawks. G Eric Comrie, one of the best at his position in the WHL, will watch for up to three weeks, while G Evan Sarthou’s status has yet to be determined. Last night, the Americans gave the start to G Nicholas Sanders, who has been with the midget AAA Calgary Buffaloes. He was a sixth-round pick in the 2013 bantam draft. Casey Kaiser, a 19-year-old from Richland, Wash., backed up Sanders. Kaiser made his first WHL appearance and start Saturday in a 7-2 loss to the visiting Calgary Hitmen. The Americans also have recalled F Zack Andrusiak, from the junior B North Okanagan Knights of the Kootenay International Junior League; F Parker AuCoin, from the midget AAA St. Albert Raiders; and F Morgan Geekie from the Yellowhead Chiefs of the Manitoba Midget AAA League. Aucoin was the 15th overall selection in that 2013 bantam draft, while Geekie was taken in the fifth round. AuCoin made his WHL debut last night; Andrusiak and Geekie were scratched, as was freshman F Max James. Tri-City didn’t show D Brandon Carlo on its injury report, but he missed his third game last night since taking a puck to the head. Carlo played for the U.S. at the 2015 WJC. Bob Tory, the Americans’ general manager, has been working in the WHL since at least 1982, including stints with the Prince Albert Raiders, Portland and Kootenay Ice. He told Taking Note that he has never experienced anything like this season. Through it all, the Americans are clinging to the Western Conference’s second wild-card playoff berth, five points ahead of the Prince George Cougars. Mike Priestner, the owner of the Saskatoon Blades, was in Saskatoon on Tuesday so he and GM/head coach Bob Woods chatted with season-ticket holders during a luncheon. . . . The Blades won’t be in the playoffs, but that doesn’t surprise Priestner, who believes the rebuild is going in the right direction. . . . He also said the franchise is losing money. “We’re not losing a bunch of money. We’re losing some money,” Priestner said. “It was expected coming in. I didn’t think the crowds would be where they’re at. I probably thought they’d be in that 4,800 to 5,000 range.” . . . Daniel Nugent-Bowman of the Saskatoon StarPhoenix was there and his story is right here. Tim Speltz, GM of the Spokane Chiefs. 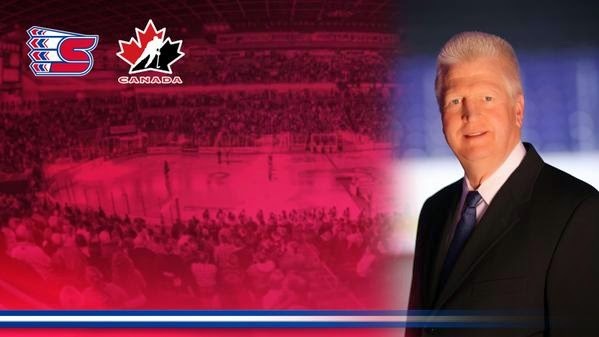 Tim Speltz, the general manager of the Spokane Chiefs since 1990, has been added to Hockey Canada’s Program of Excellence management group for 2015-16. He will work in support of the U-20 program, which primarily involved the Canadian national junior team that will play in the 2016 WJC in Helsinki, Finland. . . . Speltz is no stranger to Hockey Canada, having worked with the management group for the Canadian U-18 team that won gold at the 2014 Ivan Hlinka Memorial tournament. . . . Bruce Hamilton, the owner and general manager of the Kelowna Rockets, worked with the U-20 program for 2014-15. You know it’s baseball season when fans of the Chicago Cubs crawl out of the snowbanks and try to convince themselves that, yes, “this is our year.” . . . Dan Epstein, who is not related to Theo Epstein, is a Cubs’ fan and he has a readable piece on this subject right here. The Prince George Cougars continued their trek to Kent, Wash., by stopping in Williams Lake, B.C., on Tuesday. After a day of skating with minor hockey players, signing autographs and making friends, the Cougars presented a cheque for $1,500 to the local minor hockey association. The Cougars, who meet the Seattle Thunderbirds in Kent on Friday, will spend today in 100 Mile House. . . . If you haven’t seen this right here, it’s definitely worth a read as TSN’s Bob McKenzie remembers the late Herb Brooks. B.C. DIVISION: All five teams had the day off. U.S. DIVISION: Portland (12 games remaining) won on the road and now is three points behind idle Everett, which leads the division. . . . Tri-City (11) lost at home and remains in possession of the Western Conference’s second wild-card spot. Tri-City is a point behind idle Spokane (14) and five ahead of Prince George (11). EAST DIVISION: Swift Current (12) won at home and is a solid third, eight points behind Regina (13) and 12 points ahead of Moose Jaw (12), neither of whom played. CENTRAL DIVISION: Calgary (12) won on the road and moved into sole possession of first place in the division, two points ahead of idle Medicine Hat (12). . . . Kootenay (11) picked up a loser point on the road and now holds down the Eastern Conference’s first wild-card spot by five points over idle Edmonton (12). Kootenay is four points behind idle Red Deer (13), which is third in the division. In Swift Current, the Broncos trailed 5-2 early in the third period but roared back to beat the Kootenay Ice 7-6 in a shootout. . . . Broncos F Jake DeBrusk scored the only goal of the four-round shootout. . . . Ice F Tim Bozon gave his side a 5-2 lead with his 28th goal at 9:20 of the second period. . . . F Coda Gordon, with his second of the game and 21st of the season, cut the deficit to 5-3. . . . DeBrusk then got his 36th goal at 14:03 and D Ayrton Nikkel tied it with his second goal of the season at 16:23. . . . The Ice wasn’t done, though, and took a 6-5 lead on F Levi Cable’s 26th goal at 17:13. . . . It was left for Broncos F Colby Cave to force OT with his 28th goal at 18:35. . . . F Luke Philp scored his 27th goal and added three assists for the Ice, who got three assists from F Sam Reinhart. . . . The Broncos (30-25-5) have won three in a row. . . . The Ice (31-27-3) is 3-0-2 in its last five. . . . In Kennewick, Wash., F Oliver Bjorkstrand scored twice and F Nic Petan had four assists as the Portland Winterhawks beat the Tri-City Americans, 6-4. . . . Bjorkstrand, with goals in nine straight games, has 45 goals, one off the WHL lead. . . . Petan has eight assists over his last two games. In fact, in his last six games, he has a goal and 13 assists. . . . Portland F Miles Koules broke a 4-4 tie with his 24th goal at 14:32 of the third period. . . . That came after F Beau McCue had pulled the Americans into a 4-4 tie with a shorthanded goal at 10:09. . . . G Nicholas Sanders made 41 saves for the Americans, 17 more than Portland’s Adin Hill. . . . Tri-City was 2-for-4 on the PP; the Winterhawks were 0-for-3. . . . The Winterhawks (36-20-4) have points in six straight (5-0-1). . . . The Americans (27-31-3) have lost two in a row. . . . In Kent, Wash., the Calgary Hitmen continued their unbeaten road trip as they dropped the Seattle Thunderbirds, 3-2. . . . Calgary F Chase Lang broke a 1-1 tie with his 24th goal at 5:47 of the second period, just 4:26 after F Jake Virtanen had tied it with his 17th goal. . . . F Terrell Draude gave the visitors a 3-1 lead at 2:35 of the third. . . . Seattle F Roberts Lipsbergs got his 10th goal at 19:00 of the third. . . . According to TBird Tidbits, the Hitmen now have won six straight games in Seattle/Kent, with two of the victories coming in OT. Calgary last lost there on Oct. 26, 2002. . . . Calgary (37-18-5) is three games into an 11-game road trip and has won all three games. Overall, it has won five straight. . . . Seattle (31-22-7) had won its previous two games. Medicine Hat at Brandon, 7 p.m.
Calgary at Portland, 7 p.m.
Just heard a lady in the lobby say “I’m STILL vibrating! !”.